A locals’ favorite for big portions of breakfast and traditional Hawaiian food. : Hawaiian Style Cafe is a locals’ favorite tucked into a nondescript strip mall. Hungry crowds assemble for breakfast and lunch so get there early to grab a seat at the counter or one of the red vinyl booths. 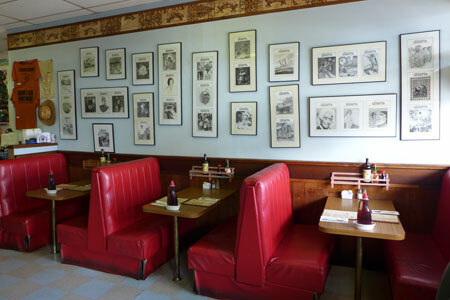 Framed covers of past Waimea Gazette issues are tacked up on the wall alongside Hawaiian Style Cafe souvenir t-shirts. The kitchen turns out big portions of morning fare like pancakes and omelets as well as burgers, sandwiches and plate lunches. The Hawaiian Plate comes with lau lau (pork wrapped in taro leaf), kalua pork, chicken long rice, macaroni salad or lomi salmon, and rice or poi. Check the white board for specials like oxtail soup, a smoked pork omelet or haupia pancakes with coconut pudding. Be sure to bring cash as credit cards are not accepted.